WDBM-FM (88.9 FM) is the successor to the Michigan State Network, which in the 1970s was the nation’s largest college carrier current radio network. It had studios in numerous MSU residence halls across campus. The Network was eventually consolidated to one carrier current station, WLFT (“The Left”), which broadcast from the former WKAR-FM public radio studios on the third floor of the MSU Auditorium Building. That space would become the first home of WDBM. 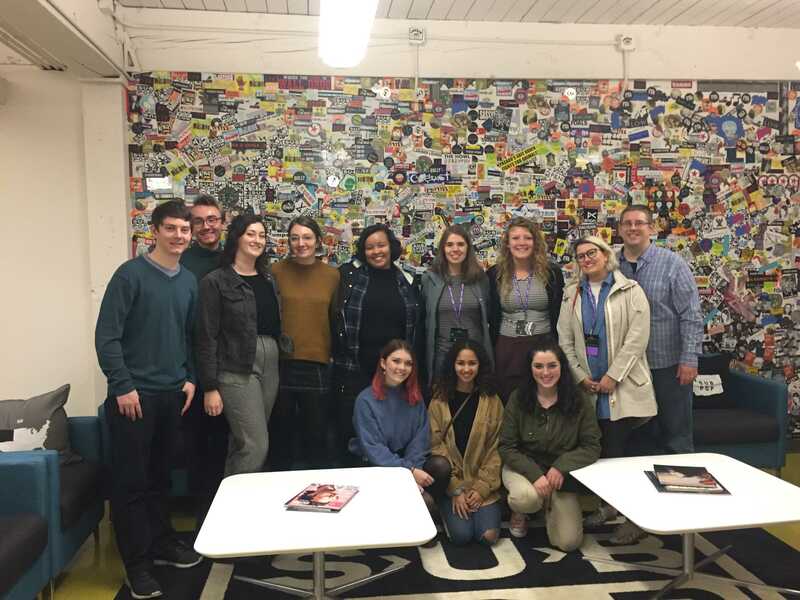 Directors visiting an Impact alumnus at Sub Pop Records. WLFT was almost like a cable service for radio. There were individual studios in various MSU dorms that broadcast music through telephone wire. Each dorm room had telephone jacks that students could plug speakers into. They could then listen and call in requests, just like at WDBM today. WDBM began broadcasting in 1989, but the station was originally licensed by the FCC with the call letters WBDM in November 1987. As the story goes, someone early on incorrectly wrote the call letters down as WDBM. Marketing and promotional items were then created with the incorrect letters. After the mistake was discovered, the station found that the WDBM letters were available and applied to the FCC to make the change. The new letters were granted in February 1989. 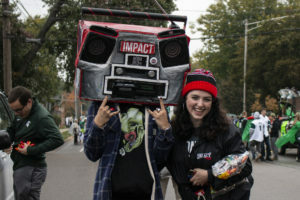 Events director with Radio Cabeza at the Homecoming parade. 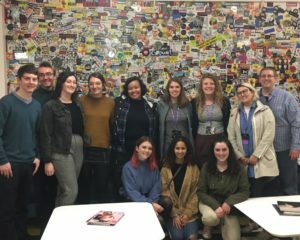 MSU’s rich history of student radio continued to flourish through the 1990s as the station grew into one of the few student-run college radio stations to broadcast 24 hours a day, 365 days a year. In 2004, the Impact was the nation’s first college station to broadcast in HD radio. From 2001 through today, the Impact is proud to have compiled an unprecedented 15 College Radio Station of the Year distinctions from the Michigan Association of Broadcasters and Broadcast Music, Inc. Nationally, the Impact has also been nominated and awarded numerous times from the likes of CMJ, College Broadcasters, Inc. and mtvU as a part of their national competitions. The reason the Impact has been able to consistently succeed and flourish annually in college radio that has seen adversity nationally is a result of the station’s evolution into much more than a simple FM radio station. The Impact will always be a radio station at its core. But as media preferences have changed, the Impact has grown to offer content across multiple platforms. This trend continues to this day. Directors at one of our coffee sessions. While only a portion of the Impact’s student volunteers and employees are singularly involved in DJing over the terrestrial signal, most work still supports what goes out over the air while also enhancing content for new fields of media. From shooting and editing professional in-studio performance and interview video content, to covering all 23 Spartan sports teams as a part of one of the largest student-run sports media outlets in the country, to managing in-house marketing, promotions, community relations and engineering departments, the Impact offers a place for any student of any major with any career aspirations to flourish in a creative, engaging, professional and fun atmosphere. 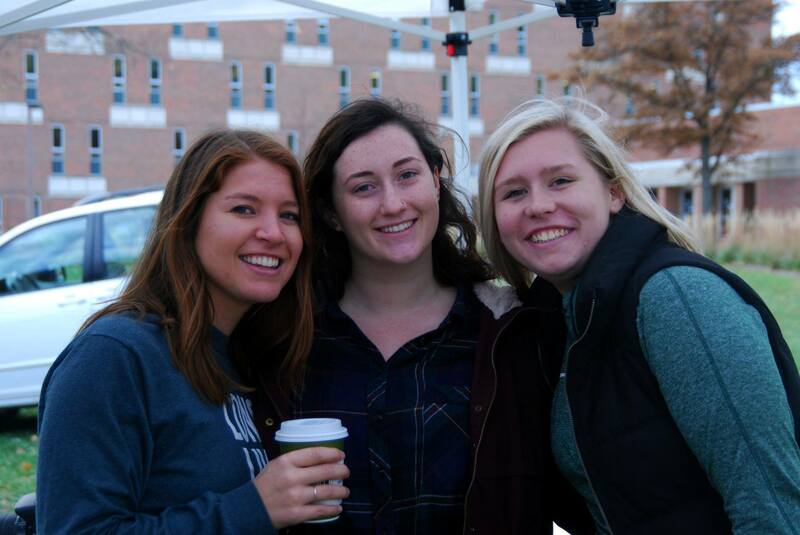 To volunteer and/or to work at the Impact you must be a Michigan State University student (undergraduate or graduate).